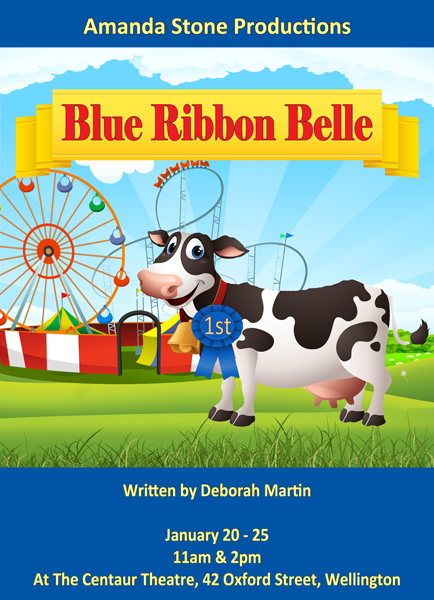 Blue Ribbon Belle is a tribute to that great country icon, the agricultural show. There is a lot of humour and fun in the show which ends with the colourful Grand Parade followed by an anthem like celebration of country life. It provides a wonderful opportunity for city and country children to become immersed in the culture of the country and farming life in a celebratory way. Staging the show also creates a great opportunity for a whole school to celebrate the theme by staging its own carnival or country fair that might feature some of the elements included in the show such as a cooking competition, an art show, picnic races, line dancing, an animal parade etc. There are 12 performance items in the show which is written in such a way that each performance group can rehearse separately and come together at the end of production to create a cohesive story. Within each performance group there are up to four small speaking parts which enables lots of children throughout the cast to have a speaking role. The magical aspect of the show allows for a lot of the animal characters to have speaking roles as well. The main characters carry the story and can rehearse separately as they mainly just interact with each other. In regards to sets, only one set or backdrop is needed which allows for an unbroken flow from scene to scene. Blue Ribbon Belle is a terrific, funny show about a small girl named Ally and her best friend in the world, Belle the cow. One day they go to the agricultural show to try their luck at earning enough prize money to persuade Ally's mum to keep Belle rather than sell her as planned. Their visit has them interacting with a lot of the fun agricultural and carnival aspects of the show. Leroy Ham, the humorous on air guide reporting from Showground Central, appears regularly to tell of all the wonderful activities at the show such as the rodeo, cooking competition, merry-go-round rides, activities at the various animal pavilions and much more. After their fun, Belle the cow is finally entered into the Grand Parade despite the conniving efforts of her rival, the self-promoting Rodney the Rooster. The show ends with a marvellous and colourful parade cheered on by an enthusiastic crowd. Belle takes the blue ribbon and all the show folk celebrate all of the friendship and fun that's a part of country life. There are 12 separate performance groups in Blue Ribbon Belle along with a small group of main characters who carry the story along. These characters can rehearse their parts separately and then begin to work with each of the performance groups later on in production. The actors who portray these characters will remain in the wings during the show since they will be called on regularly as they link each of the performance items together. The first of the main characters is Ally, a mature and sympathetic character who is trying to prevent her best friend, Belle the cow, from being sold. This is a role that should go to a very capable actor who has good chemistry with the actor in the role of Belle. The role of Belle would be best suited to someone who is very expressive with their face and body language as the role requires a lot of non-verbal communication and communicating solely through her mooing. Rodney the Rooster is an attention loving character who loves to strut his stuff. Think of him as Elvis with feathers. This character would work great with someone who isn't self-conscious and does well with physical comedy. A narrator of sorts, Mr. Leroy Ham is a comedic character who parodies the overblown personas of TV and radio reporters. This role should go to someone who has a big personality and a good, strong voice. The last of the main characters is a group of carnival workers who act as stage hands to bring props and sets on and off the stage. These characters can be in full costume and be given their own unique quirks and flourishes to flesh them out and make them more identifiable to the audience.